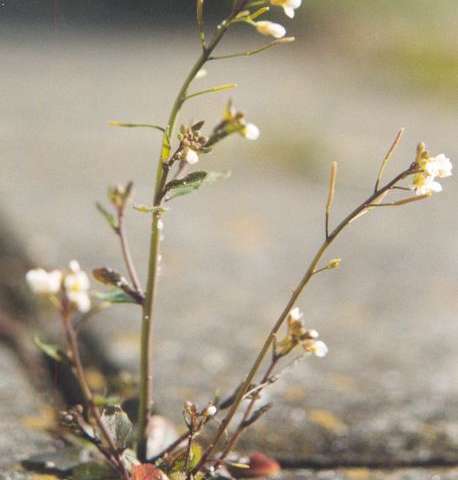 Plants have control mechanisms that resemble those in human senses. According to a new Weizmann Institute of Science study, plants adjust photosynthesis to rapid light changes using a sophisticated sensing system, much in the way that the human eye responds to variations in light intensity. This sensory-like regulation operates at low light intensities, when the photosynthesis machinery is most efficient but also most vulnerable to sudden light increases. A widely accepted view has been that since the more sunlight a plant absorbs, the more energy it has for growth, photosynthesis would tend to increase proportionally to sunlight intensity. Only upon reaching a level at which excessive radiation causes damaging "sunburn" would the plant turn on repair mechanisms and turn photosynthesis down. Prof. Avihai Danon of the Plant and Environmental Sciences Department and his colleagues evaluated plant fluorescence (light reemitted by nonproductive photosynthesis, used as a nonintrusive proxy to measure photosynthesis levels) at low light exposure, and they were surprised to see a back-and-forth pattern. Danon initiated a collaboration with Prof. Uri Alon of the Molecular Cell Biology Department, whose lab studies biological networks and circuits, among them, those in the human body. The team—Avichai Tendler (from Alon's lab) and Drs. Bat Chen Wolf and Vivekanand Tiwari (from Danon's lab) - exposed Arabidopsis thaliana, model plants from the mustard family, to a series of step-by-step, 10-minute-long increases in light intensity in the low to moderate range, roughly equivalent to outdoor morning light—that is, below the level that causes stress to the plants. As reported in iScience, the scientists saw that the fluorescence, instead of rising steadily when the light grew stronger, soared for a short while at each step, then dropped back to the initial level. Each time, its peak was smaller than at the previous step. This was because, as the researchers found, when the light grew stronger, fewer photons arrived at the plant's photosynthetic reaction center than would have been expected from the increase in light intensity. Each time the researchers had to double the light's intensity to produce the same fluorescence peak as at the previous step—a pattern typical of sensory mechanisms in bacteria, animals and humans. These findings supply evidence that under low-light conditions, the control mechanisms of photosynthesis resemble those operating in such sensory systems as, for example, human vision. When the pupils adjust to the brightness of light, these adjustments not only protect the retina but ensure we remain sensitive to our surroundings despite changing light conditions. When the pupils are narrow, we distinguish only high contrasts in lighting. In low-light conditions, for example at dusk, the pupils widen, letting in more light, thus enabling us to identify objects that differ only slightly in their reflected light. In the same manner, the photosynthesis antennae—the light-harvesting complexes of proteins and chlorophyll molecules in the plant—shrink in bright light and enlarge under low-light conditions. Like pupils, when the antennae grow larger, they harvest the light more efficiently and grow more sensitive to small changes in light intensity—but they also become more vulnerable to change, especially sudden change. "Plants handle photosynthesis in a cautious manner that sacrifices efficiency in the short term for the sake of long-term stability," Danon says. "In a way, the photosynthesis machinery 'senses' the environment, making rapid adjustments to the amount of 'harvested' light before the situation runs out of hand, rather than escalating its activity in an uncontrolled manner until sustaining damage." The newly discovered controls kick in fast, buying time for the slower mechanisms that adjust photosynthesis to developing conditions. This exquisite coping strategy is one of the ways in which plants make the most of sunlight under rapidly changing outdoor conditions, for example, when clouds come and go, or when the wind alters the angle of leaves to the sun.